The annual Saints and Angels Party will be held on Wednesday 31st October from 4.30pm – 6.30pm. At 6.30pm there will be a Mass for the Vigil of All Saints. You can see photos from previous Saints and Angels Parties here (2017) and here (2016). 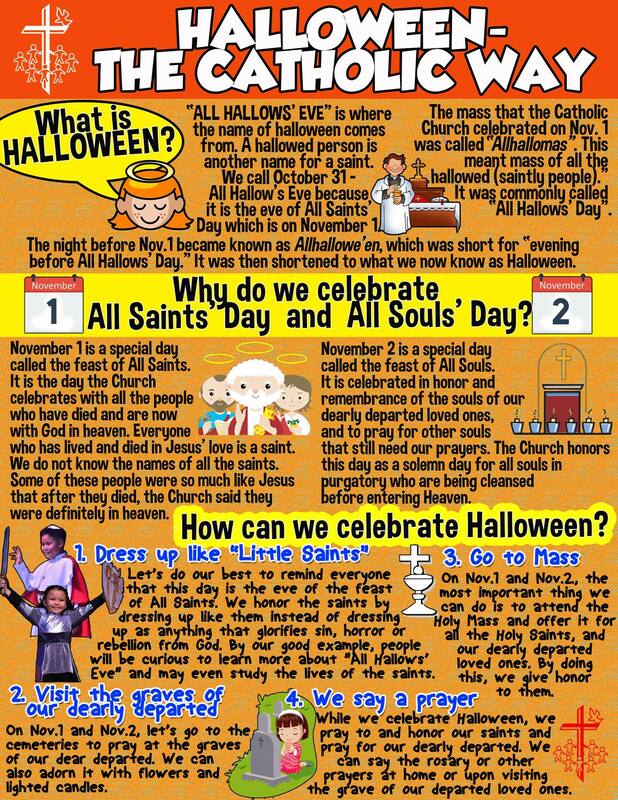 Here is an infographic explaining briefly why we celebrate All Saints Day, and the Catholic origins and traditions of Hallowe’en. Catholic.org has a list of fun facts about Saints. Gracewatch Media have a picture story book about All Saints Day Parties, which you can preview online here. The story follows two children deciding which saints to dress up as, and includes information about some well-known saints. If you need some costume inspiration, this website has a huge list of costume ideas for children of all ages (and all costume-making skill levels)! Posted in News on October 4, 2018 by admin.